"As the floods recede, tales of selfless heroism emerge. 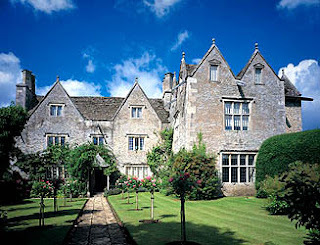 At Kelmscott Manor in Oxfordshire, once home of the Victorian arts and crafts pioneer William Morris, staff and villagers stepped in to rescue tapestries, furniture, and works of art as water seeped up through the floor. And they did more: with the neighbouring village cut off from the outside world, the manor's manager, Tristan Molloy, took to a boat to deliver supplies from the manor's well-stocked restaurant refrigerators to local residents." "Prompt action by Kelmscott Manor's curatorial staff has ensured that unique works of art made by William Morris have been saved from flood damage at the Oxfordshire home of the arts and crafts movement founder. "Jane Milne said they had been helped enormously by residents from the village; in return Tristan Molloy toured the village in his homemade boat dispensing food from the Kelmscott cafe to neighbours who were left without electricity for two days as a result of the worst floods in the area since July 1968. Bravo indeed! Couldn't bear to think of the tapestry woven by the man himself might have been ruined. A little bit of welcome relief to brighten my day. Is there an image of the Cabbage & Wine tapestry?